There is a vacancy for a parish councillor, if anyone is interested, please contact the Clerk. We are proud of our town and hope you enjoy visiting it and our website! Brampton is a small market town and civil parish within the City of Carlisle district of Cumbria, England about 9 miles (14 km) east of Carlisle and 2 miles south of Hadrian's Wall. 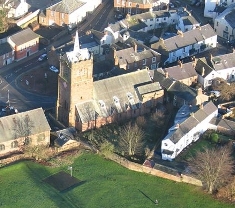 It is situated off the A69 road which bypasses it. Brampton railway station, about a mile outside the town itself, is located on the Newcastle and Carlisle Railway. St Martin's Church is famous as the only church designed by the Pre-Raphaelite architect Philip Webb, and contains one of the most exquisite sets of stained glass windows designed by Sir Edward Burne-Jones and executed in the William Morris studio.